Jeremy is a grad student with a quick mind and insatiable thirst for knowledge. What he's currently most curious about is the infamously strict librarian at the small private library attached to his university. 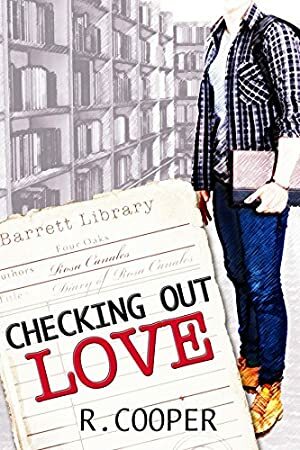 He has a weakness for devastatingly clever jerks, so despite his looming thesis, Jeremy decides to pay the famous special collection -- and its curator -- a visit. But instead of an intimidating beast of a librarian, he finds the librarian's soft-spoken assistant, Benj. Quiet, shy, guys with pretty eyes and handmade cardigans are not Jeremy's type. Jeremy is too smart, and weird, for anyone so sweet. He'd walk all over them, or find them boring after five minutes. Which doesn't explain why he keeps coming back to the library, despite never once encountering the notoriously protective special collections librarian. Perhaps if he weren't so distracted by Benj's surprisingly impressive shoulders and the absolutely charming library he runs, he'd notice there's more to Benj than knitted sweaters. Log In to track R. Cooper on eReaderIQ. to be notified each time the price drops on any book by R. Cooper. to stop tracking R. Cooper. Log In to track Lyn Forester on eReaderIQ. to be notified each time the price drops on any book by Lyn Forester. to stop tracking Lyn Forester. We started tracking this book on February 15, 2016. This book was $1.26 when we started tracking it. The price of this book has changed one time in the past 1,163 days. The current price of this book is $1.32 last checked 3 months ago. We last verified the price of this book about 3 months ago. At that time, the price was $1.32. This price is subject to change. The price displayed on the Amazon.ca website at the time of purchase is the price you will pay for this book. Please confirm the price before making any purchases.